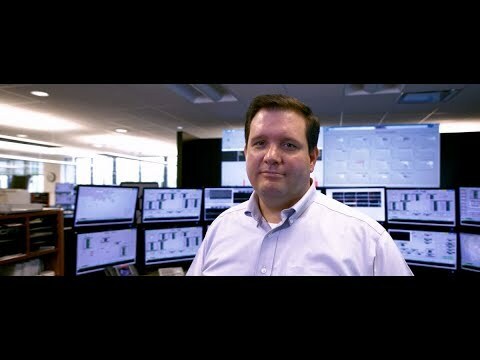 Will Bentley manages controllers who remotely monitor and operate thousands of miles of pipeline across the U.S.
Will Bentley is a console supervisor for the Chevron Pipe Line control center in Houston, Texas. Will and the control center team manage the pipeline systems to ensure Chevron safely meets its daily commodity transportation commitments and protects assets through diligent surveillance of remotely monitored facilities. "It's kind of like being an air traffic controller, only instead of planes and people, we’re controlling pipelines and hydrocarbons." Controllers start and stop pumps, open and close valves, monitor tank levels, pipeline flow rates and cameras, communicate with customers and other pipeline facilities, and actively pursue any indication that the system is not running as it should. "We're looking after 3,000 miles of pipe carrying about 1.2 million barrels, every day." Will is responsible for overseeing the operations and control of pipelines across the continental United States. He also sees his role as a mentor and enjoys helping people grow their capabilities, take on greater responsibility and move upward into other roles. "Being a supervisor is often like being a coach, and helping people overcome limitations or master new skills has been very rewarding to me." Will has four children under the age of 6 and spending time with them reinforces the importance of Chevron's commitment to protecting people and the environment. Living by the motto 'when in doubt, shut it down and find out,' Will and his operators keep safe pipeline operations at the forefront of everything they do. "My favorite part about this job is knowing that what we do matters."